Coordination Overcomes Challenges - McKenney's Inc.
McKenney’s needed to install a complete condenser water plant including pumps and cooling towers. 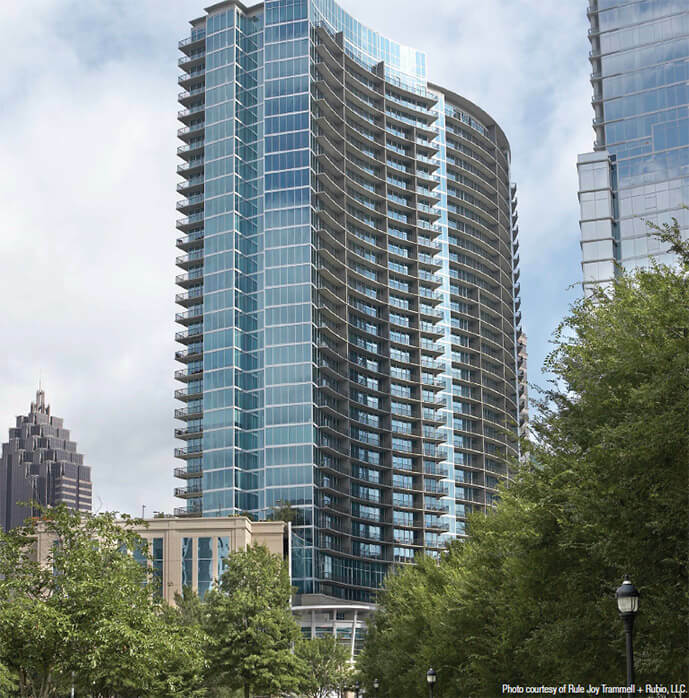 Simultaneously, water source heat pumps in each of the approximately 350 units spread over 35-floors had to be installed in the condominium tower. Rough-in had to be coordinated in very tight spaces with nine-foot floor-to-floor heights. Extensive planning, shop drawings, prefabrication of piping and sheet metal ductwork, and off-site pre-assembly contributed to the successful installation. The team also carefully coordinated equipment, material deliveries and packaging necessary for lifting the components to all 35 floors. They also helped create and drive the schedule to complete the work at one time and minimize return trips into the condominiums. Building owner Daniel Corporation was impressed by the team’s very high productivity and quality work that resulted in on-time completion with no injuries.